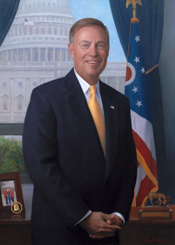 OXLEY, Michael Garver, a Representative from Ohio; born in Findlay, Hancock County, Ohio, February 11, 1944; B.A., Miami University, Oxford, Ohio, 1966; J.D., Ohio State University College of Law, Columbus, Ohio, 1969; Federal Bureau of Investigation, 1969-1972; lawyer, private practice; member of the Ohio state house of representatives, 1972-1981; delegate to Ohio state Republican conventions, 1972-1980; delegate to Republican National Conventions, 1976 and 1984; elected as a Republican to the Ninety-seventh Congress by special election, to fill the vacancy caused by the death of United States Representative Tennyson Guyer, reelected to the twelve succeeding Congresses (June 25, 1981-January 3, 2007); chair, Committee on Financial Services (One Hundred Seventh through One Hundred Ninth Congresses); not a candidate for reelection to the One Hundred Tenth Congress in 2006; died on January 1, 2016, in McLean, Va. Videocassette: 1982, 2 commercials on 1 videocassette. The commercials were used during Michael Oxley's campaign for the 1982 U.S. congressional election District 4 of Ohio, Republican Party. Representative Oxley recounts the excitement of winning the baseball game. Representative Oxley describes the camaraderie between congressional baseball players. Representative Oxley explains the regional uniform choices of Members.